Yoga means union. It's the pursuit of balance and harmony in life through the union of mind, body and spirt. Patanjali's yoga sutra 2.46 states sthira sukham asanam. This can be translated as "be steady and at ease in the posture". It refers to our state in a yoga pose, but also generally in our lives. Yoga helps us find the equanimity of being both steady in our beliefs, values and sense of Self, but also at ease, flexible, and joyful in a world that can often be chaotic and frightening. You may have various ideas and stereotypes about what yoga is, or isn't, based on your experience to date. Like any philosophy, there are important teachings and practices which are fundamental to yoga, but atop those teachings lies a yogic journey which is as unique to the practitioner as the individual is her/his self. I try to practice and teach yoga like I approach life - with curiosity, respect, effort, awareness, kindness, and humor. I strive to respect, pay homage to, and teach the practice in its authenticity, while also recognizing the modern realities of the society we live in today. The beauty of the practice is that much of its ancient wisdom is as relevant today as ever. 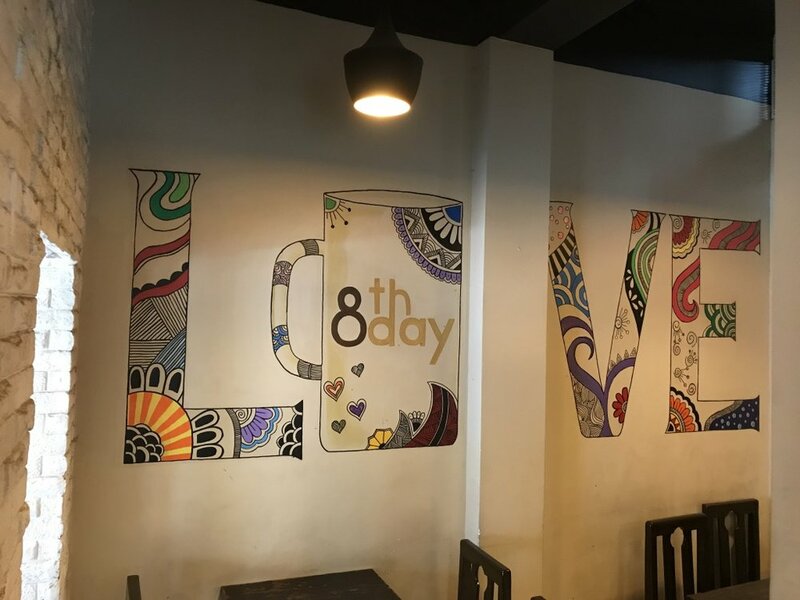 A mural at 8th Day Cafe in Kolkata, India. With a cup of coffee, an egg and cheese sandwich, a slice of banana bread, The Teachings of Ramana Maharshi, and "Split Stones" by Maggie Rogers playing in the background - I think I may have experienced a millisecond of the understanding of Atman. We don't grow without challenges and we don't find fulfillment without effort. But we can try our best to do our work and persevere through challenges with a positive attitude and respect for ourselves and others. Soul-searching is challenging. It requires deep introspection, brutal honesty, acceptance of self and the world, an open-mind, and an even more open heart. There will be frustration, there will be doubt, there will be pain, and probably some tears. Welcome to the party. But all that will ultimately be outweighed by increased levels of joy, fulfillment, certainty, pride, confidence, and most importantly, love - for your self and for others. Everybody encounters struggle, hardship and some level of suffering in their lives, and certainly some do more than others. But without suffering there would be no need to seek meaning and joy. The duality of life can drive us crazy. There's so much horror and so much beauty. There is violence, injustice, and hate...and there is peace, justice, and love. Yoga teaches us that amongst the chaos and suffering there is also Truth. And that is Atman, or the omnipresent force of creation manifest in everything in the universe. I believe the purpose of life is to seek, connect with, and express our individual piece of this Atman (our Souls or Jiva-Atma), in its truest form. Live, love, create - that is what we are here to do. I wrote this on my apartment wall on April 26, 2017. I still believe it. Life is an individual experience at its most fundamental level. Our lived experiences shape our perceptions and our perceptions shape our realities. Through the practice of yoga, the world stays the same, but our perceptions, and thus our realities, change as our mind-body mechanism begins to transform from the practice. Living the fullest expression of our souls requires a fundamental belief in the sovereignty of the individual. This means respect for ourselves and respect for others, EVEN those we disagree with! Becoming the best versions of ourselves requires us to focus on our own personal development, but also to support others on their journeys and to be vulnerable enough to allow ourselves to be supported by a community. Let's all find our own Inner Swan (Soul) and help each other soar to new heights!